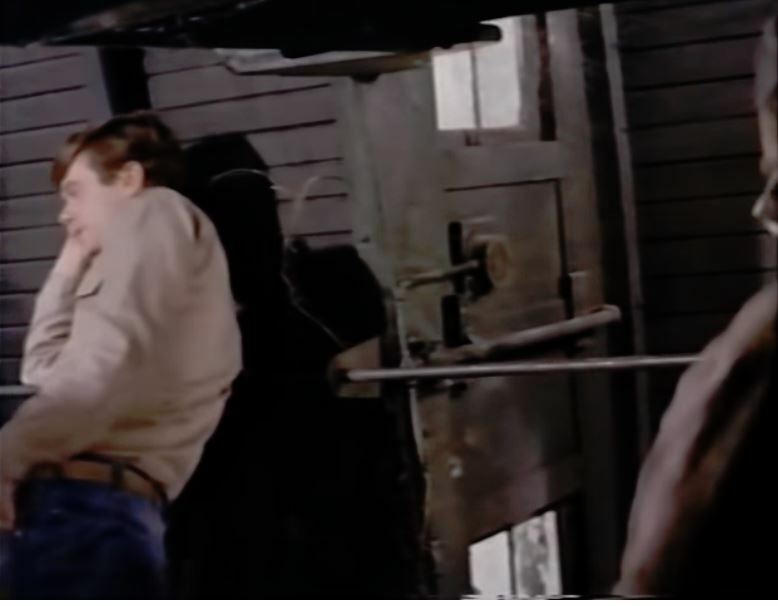 Many apologies for the terribly fuzzy screen captures in this review. 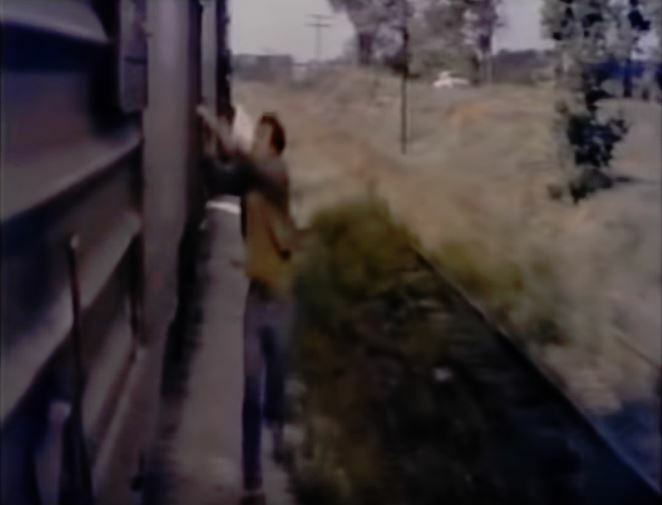 Opening shots of an L&N way freight as a trainman rides the front steps to put their train together. 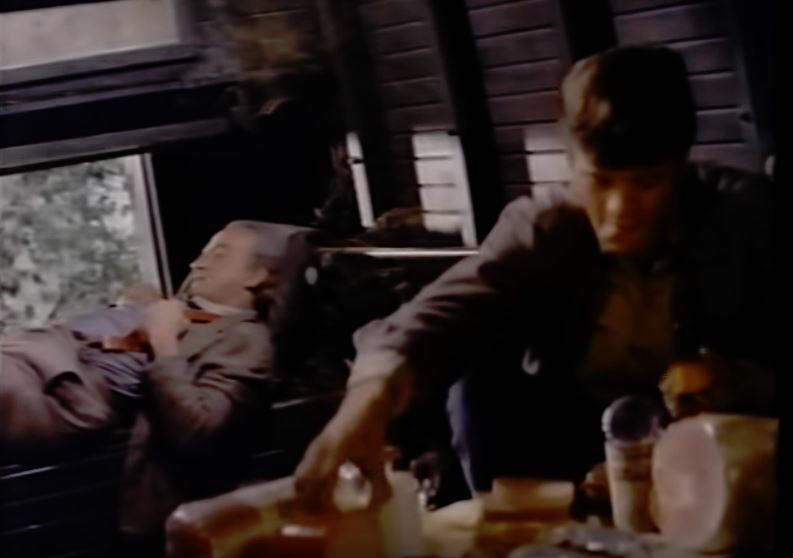 As the freight leaves town, Curley (an Army deserter played by Michael Sarrazin) is astonished to see Mordecai unceremoniously tossed from his side-door Pullman. 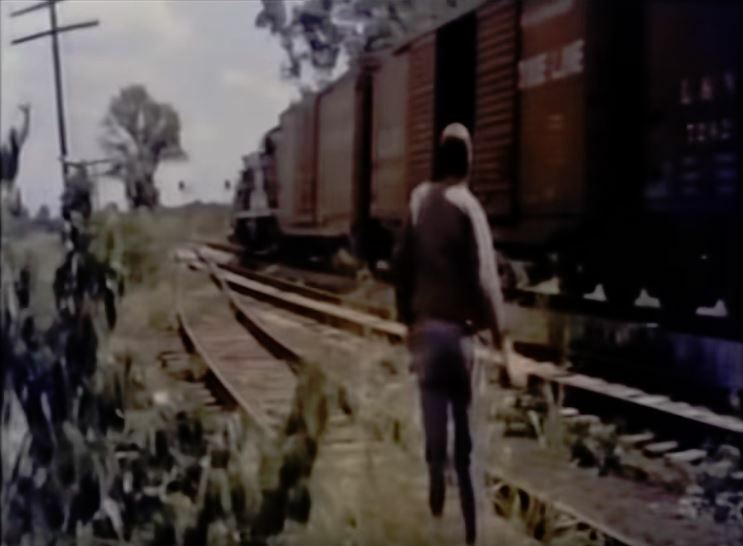 Out of curiosity, Curley bails off the slow-moving freight to investigate. 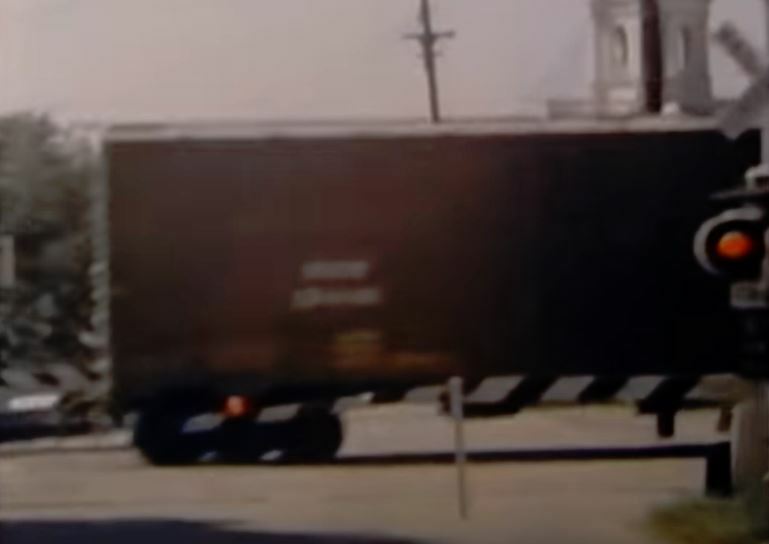 All the opening credit shots were taken at Paynes Depot, Kentucky. 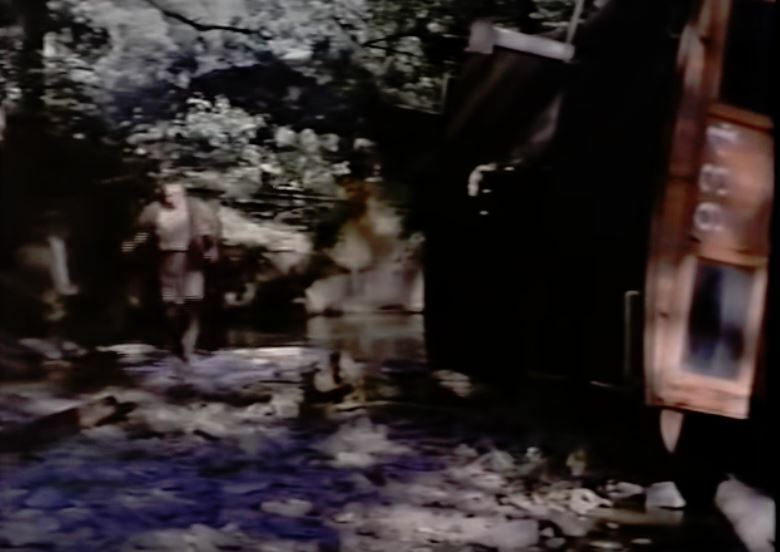 After the way freight departs town, Curley leads Mordecai across the tracks and down to an abandoned caboose where he had been holed up for the last couple days (avoiding the Military Police). 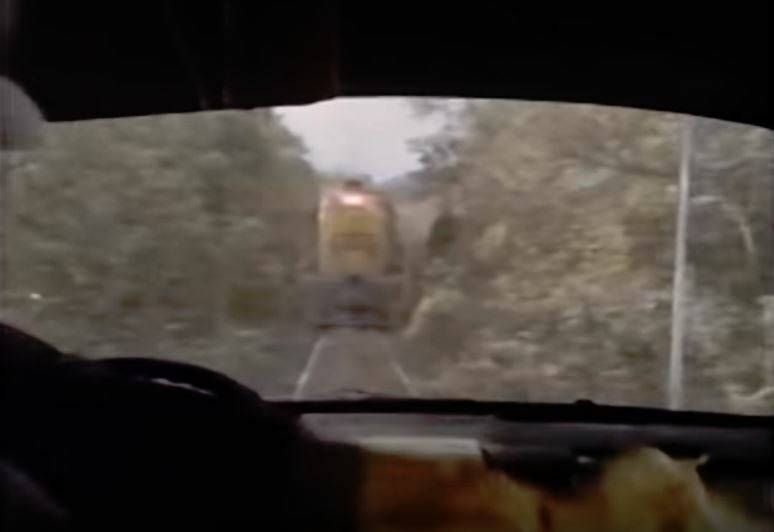 Behind Curley, you can just make out the cupola windows on the car. 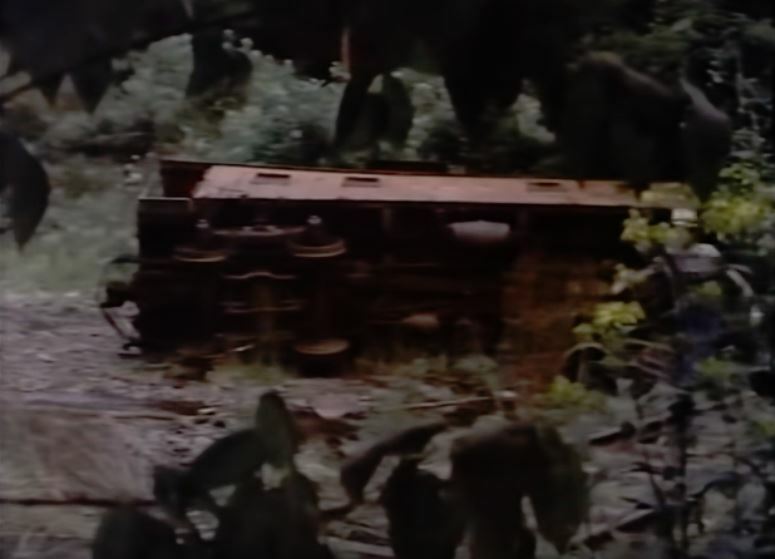 The caboose (on its side and off the tracks) is L&N #934. Also note the C.T.C. signals in the first image. 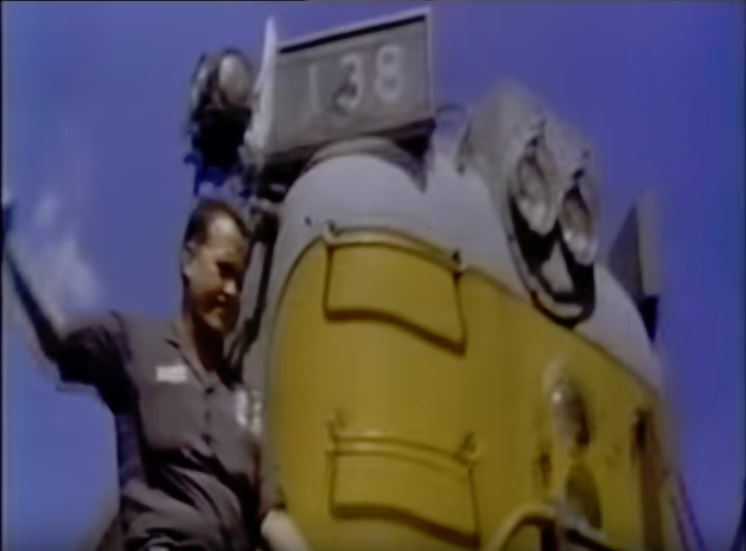 For some reason, the filmmakers threw in a distant shot of a C&O yellow and blue nicely-matched streamliner with EMD E units on the point. 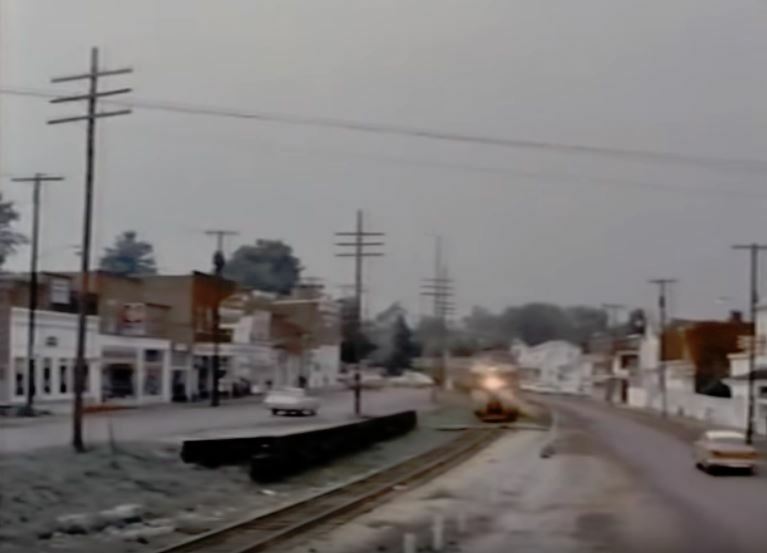 The location is Midway, Kentucky and according to my October 1963 Official Guide of the Railways, this is either C&O train 21 or 22, the Louisville, Kentucky section of the “George Washington” from Washington, D.C.
After pulling a con in the town’s store (the old Three Card Monte scam), the boys are back at the caboose having lunch and a wee drop of whiskey. 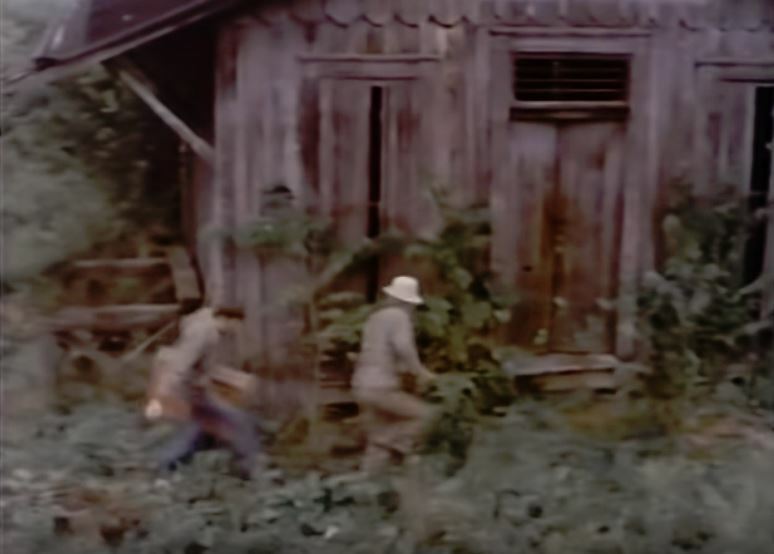 Eventually, the townsfolk realize they’ve been had and chase Mordecai & Curley out of their hiding place. 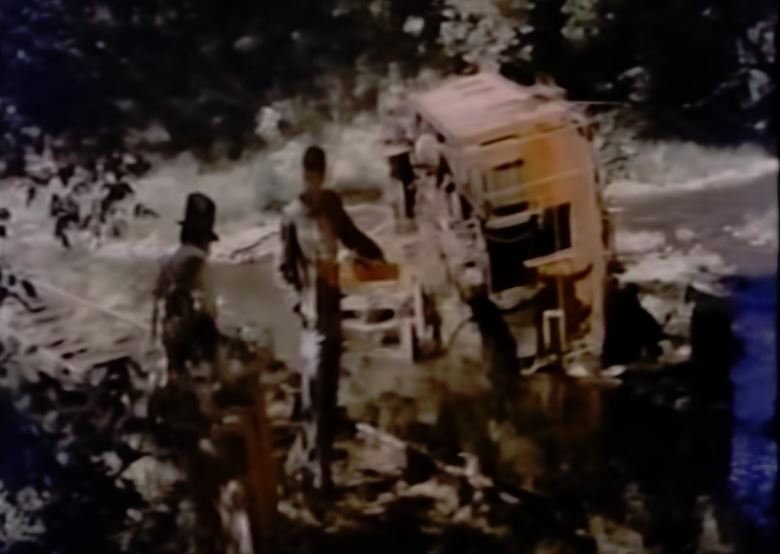 The caboose, trestle and stream scene was filmed in Frankfort, Kentucky at the Old Crow Distillery on Glenns Creek Road. 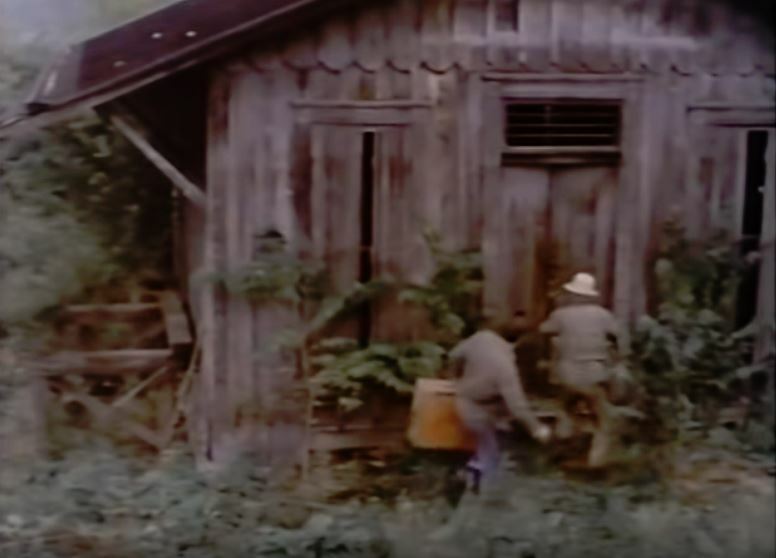 The boys finally lose their pursuers at what looks like an old abandoned railroad depot. No idea of the location – perhaps the above Old Crow site? 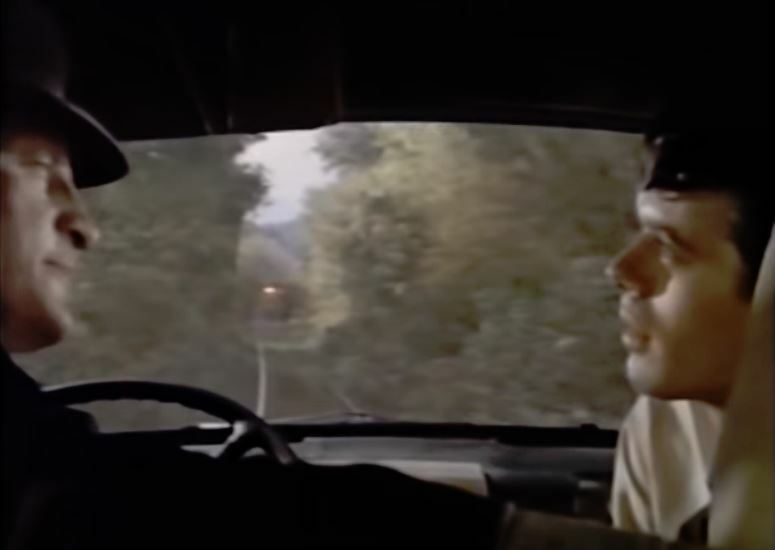 MUCH PLOT LEFT OFF HERE including a spectacular car chase in a red Plymouth Valiant convertible. SURPRISE! 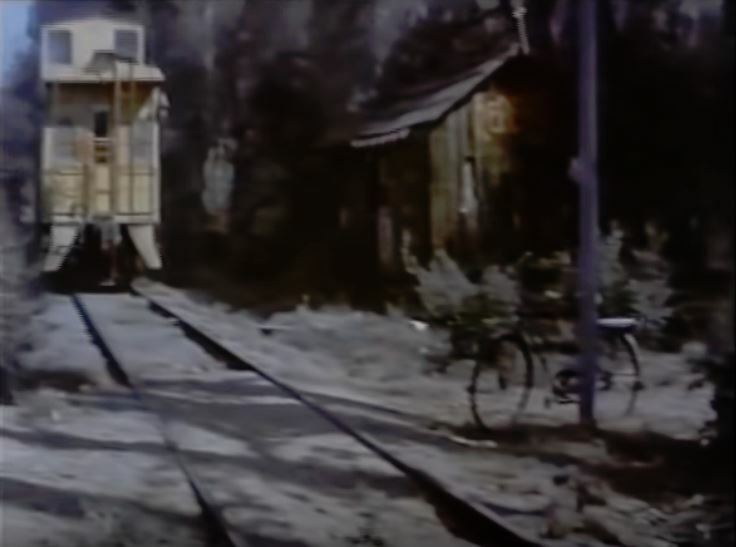 There is a THIRD railroad depicted in this movie. 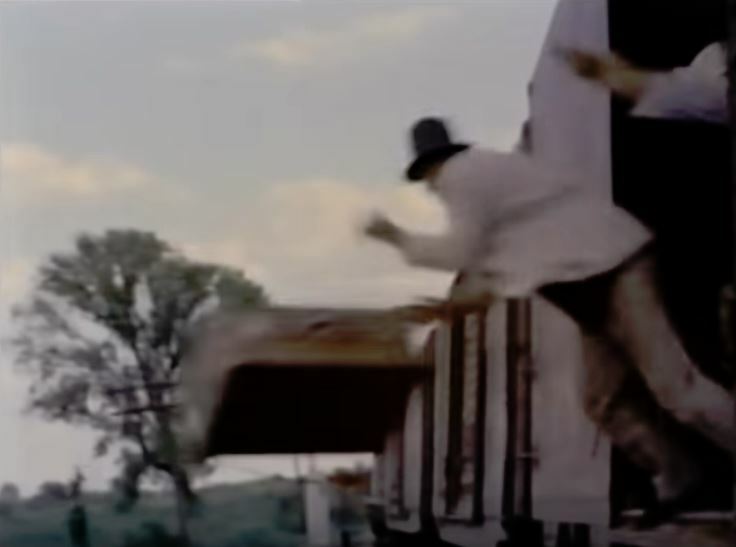 Here we see a Southern Railway EMD high-nose Geep pulling one box car in the path of the speeding convertible. 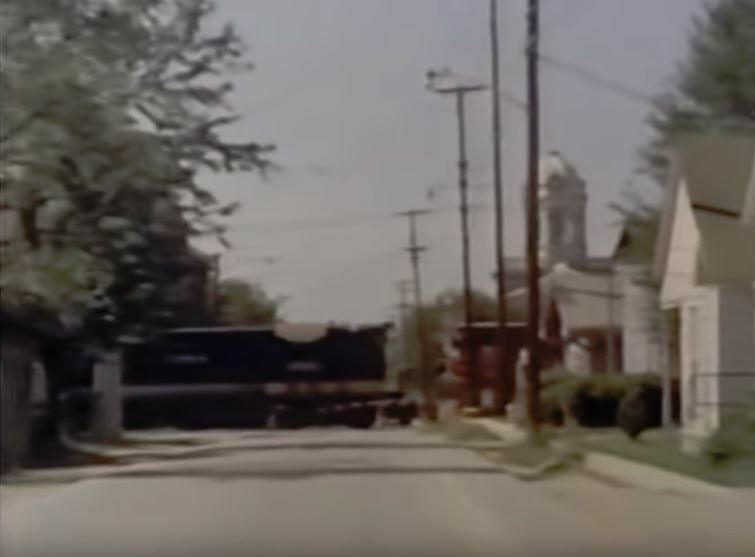 These scenes (and the car chase) were filmed in Lawrenceburg, Kentucky. 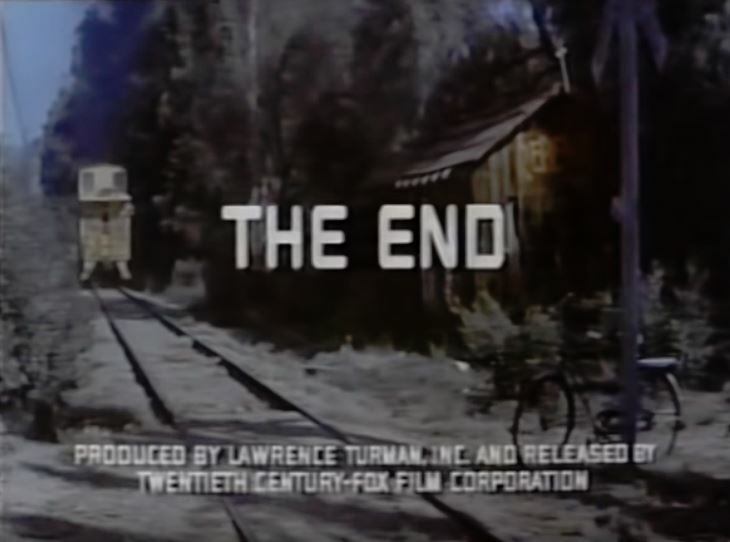 Again referring to my Official Guide, Southern was the only railroad to serve Lawrenceburg. 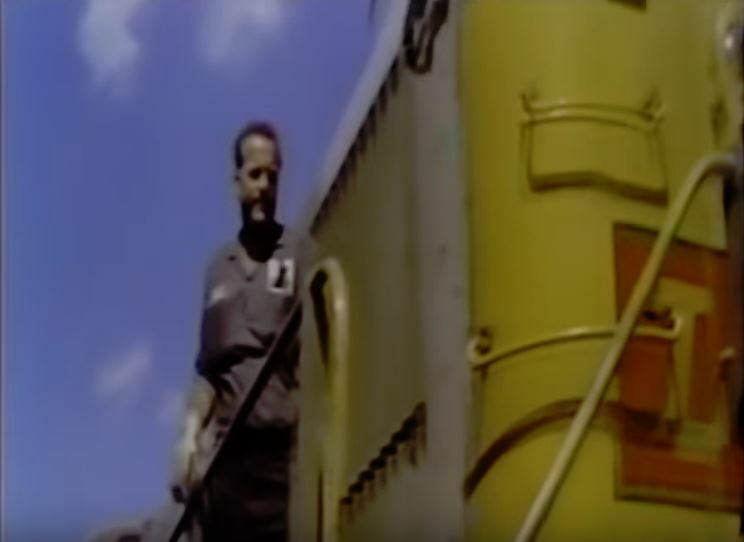 All SOU reporting marks have been carefully painted out on the engine and box car — methinks Southern Rwy. didn’t want to be too closely associated with this picture. 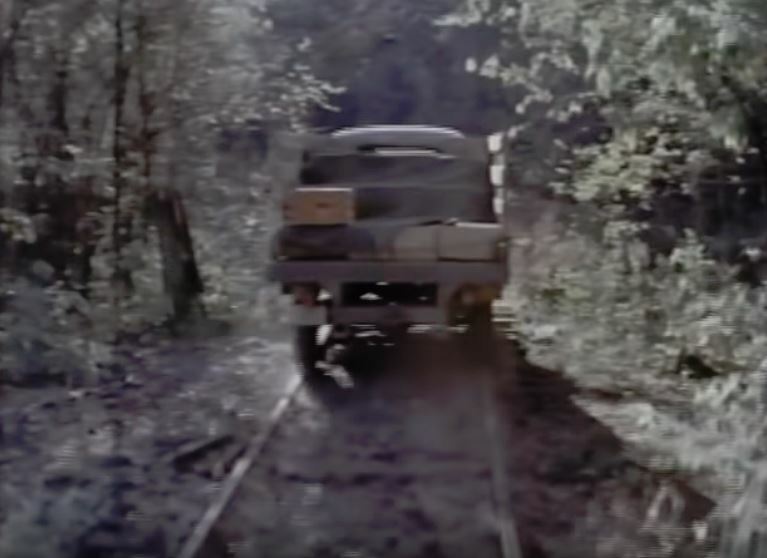 Mordecai & Curley find themselves once more trackside — with a moonshiner’s truck loaded with White Lightning! 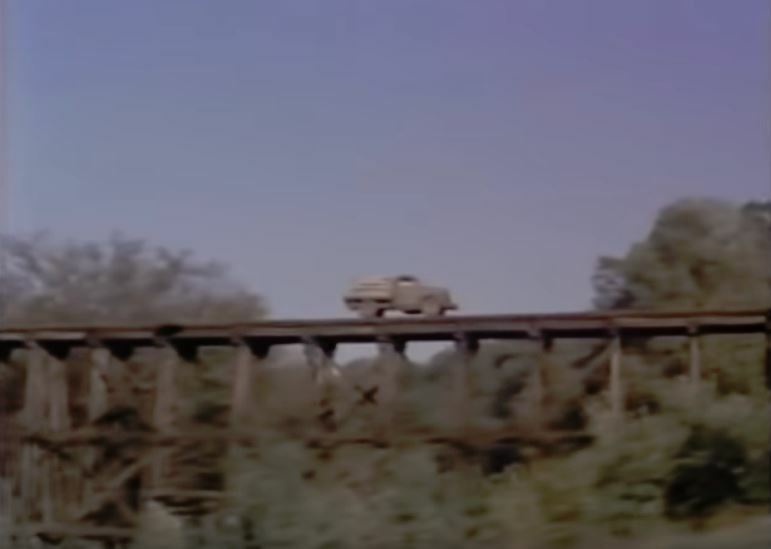 With all road exits blocked by the sheriff, the boys back the truck onto the rails, let a little air out of the tires and make their escape as a Hi-Rail. 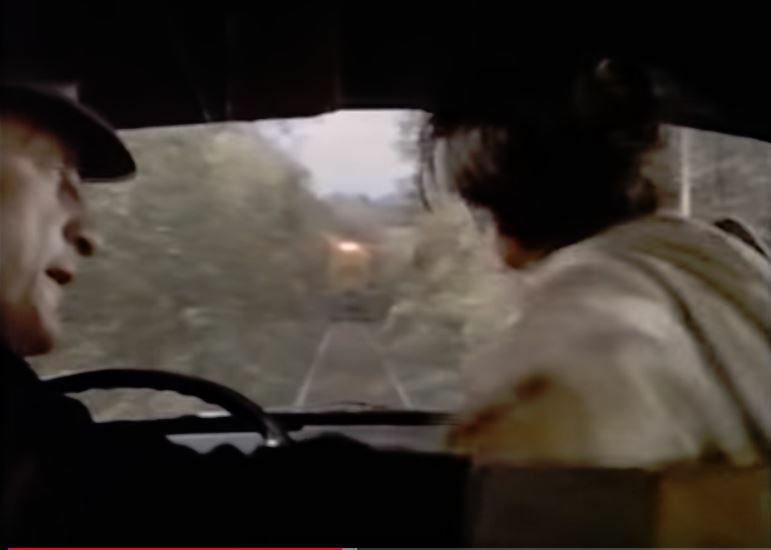 Their escape down the tracks is so serene, they fail to notice the oncoming train (looks like that L&N RS3 again). 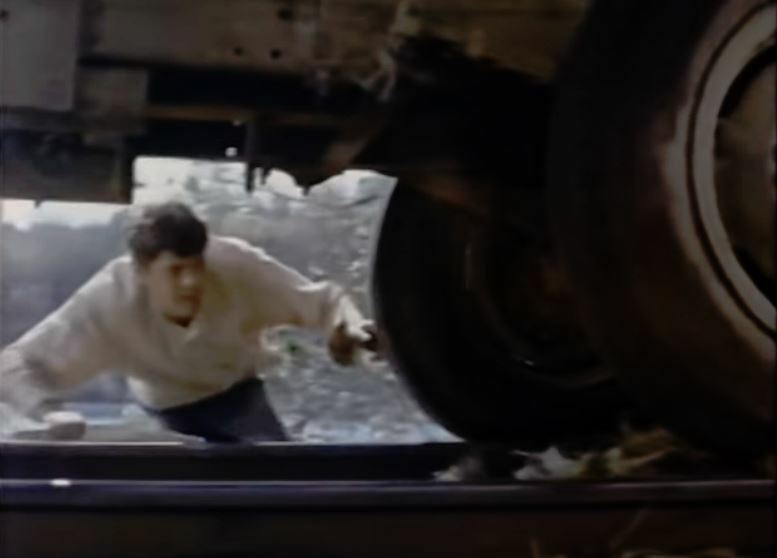 At a conveniently-placed crossing, Mordecai yanks the truck off the rails at the last minute. 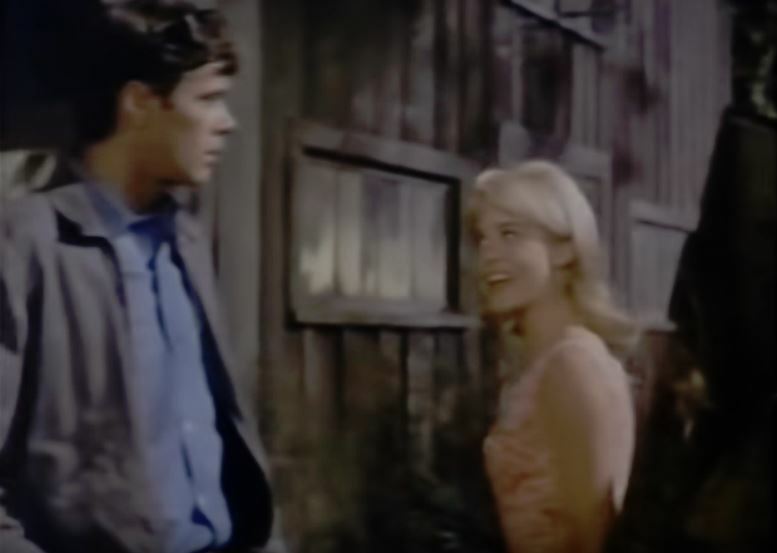 It has nothing to do with the train bits, but lovely Sue Lyon as Bonnie Lee Packard (rawr-RAWR!) flashes her baby blues at Curley. Cheesecake interlude…. 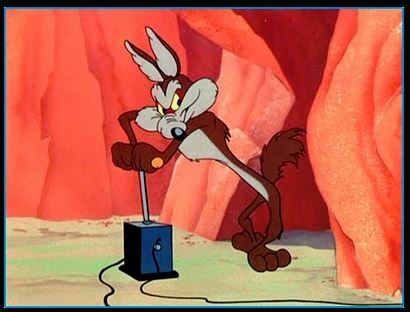 Okay, back to the action. 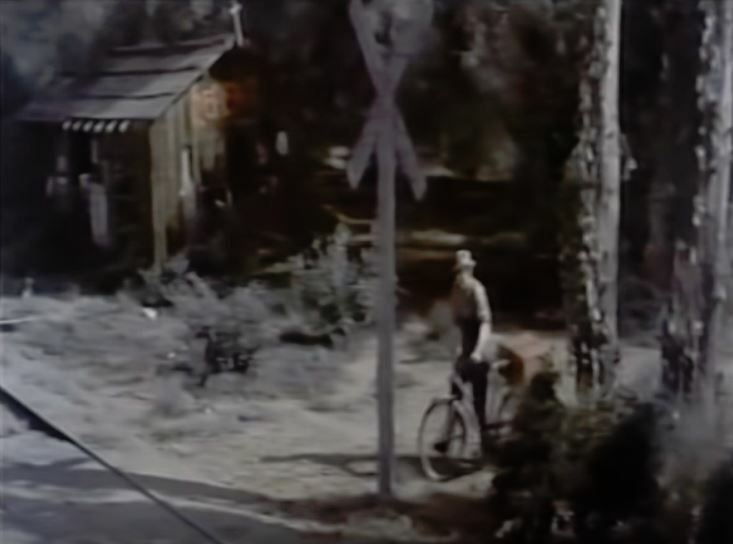 I cannot resist this picture of Curley with his plunger holding everyone at bay just long enough for his new friend Mordecai to escape by bicycle…to the railroad tracks, naturally. 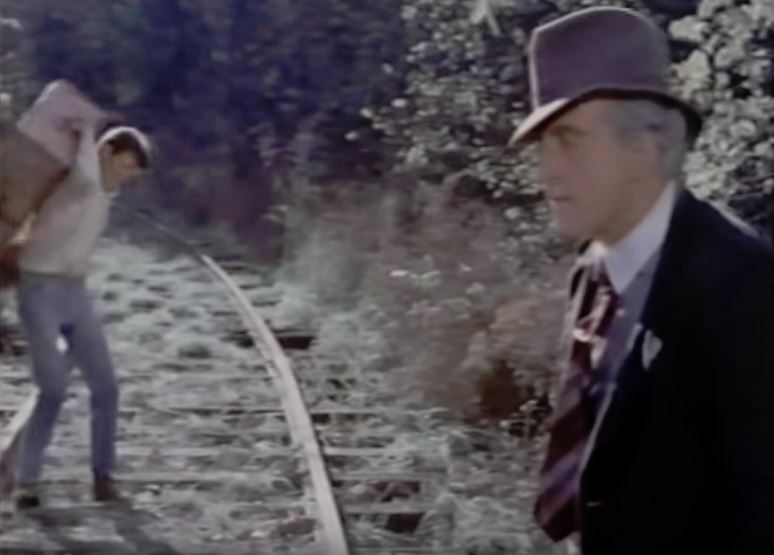 Of course, a train comes along IMMEDIATELY for Mordecai to hitch a ride (how come that never happens when I go railfanning?) 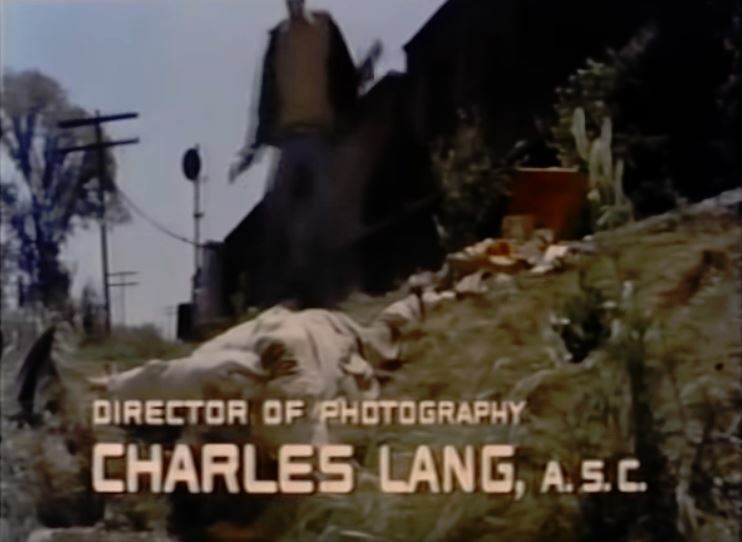 as the credits roll. 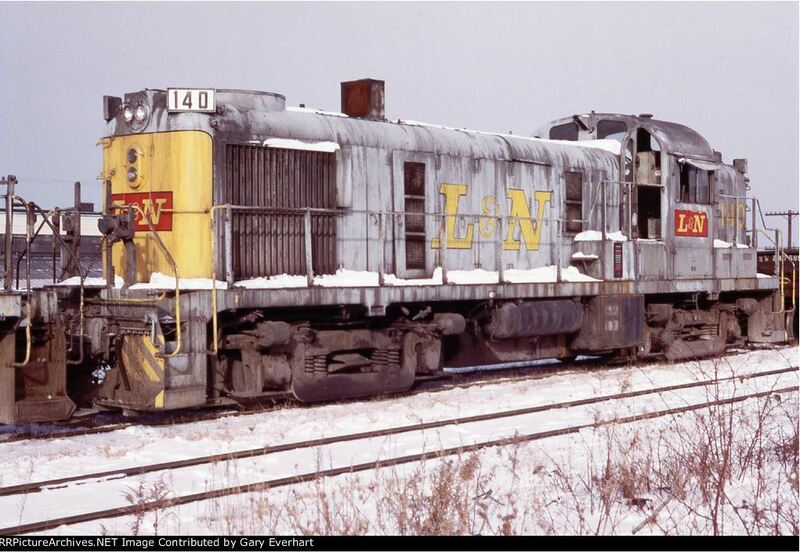 This appears to be an L&N EMD Geep 9 or something instead of the previously-used Alco with a modern yellow caboose bringing up the rear. 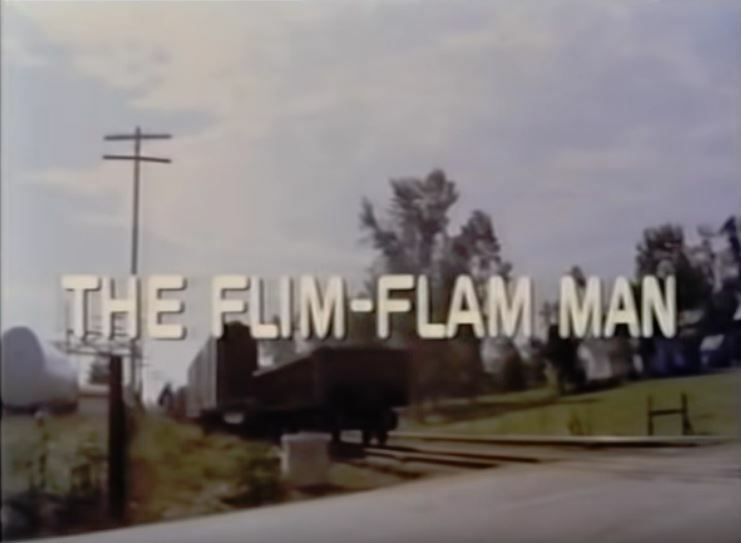 I want to thank whomever posted the movie locations in Imdb for The Flim-Flam Man as it really helped with identification and context of the railroad scenes. 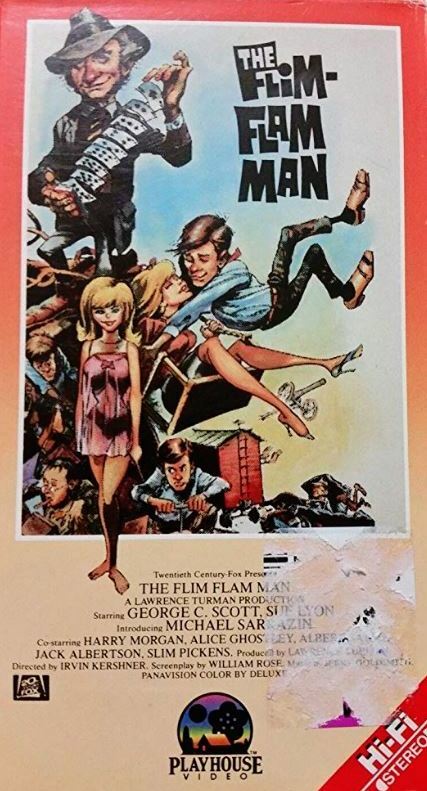 A pretty good movie! 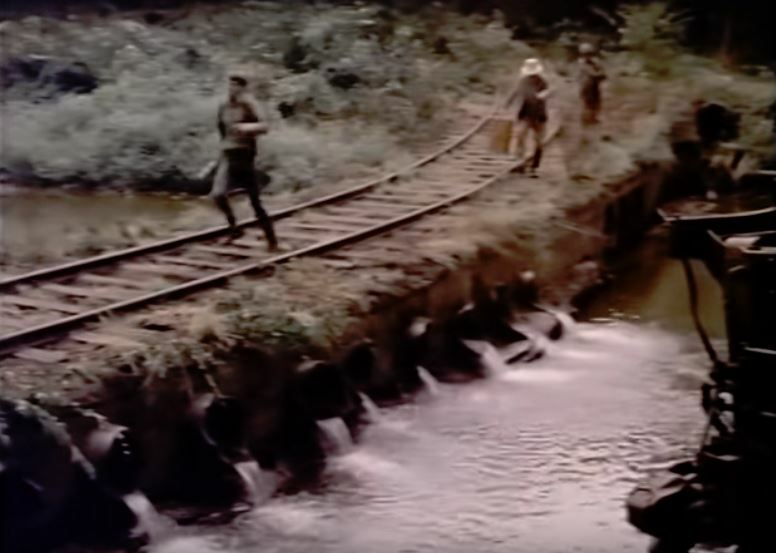 Three different railroads represented and mostly filmed in a State not normally associated with movie making. 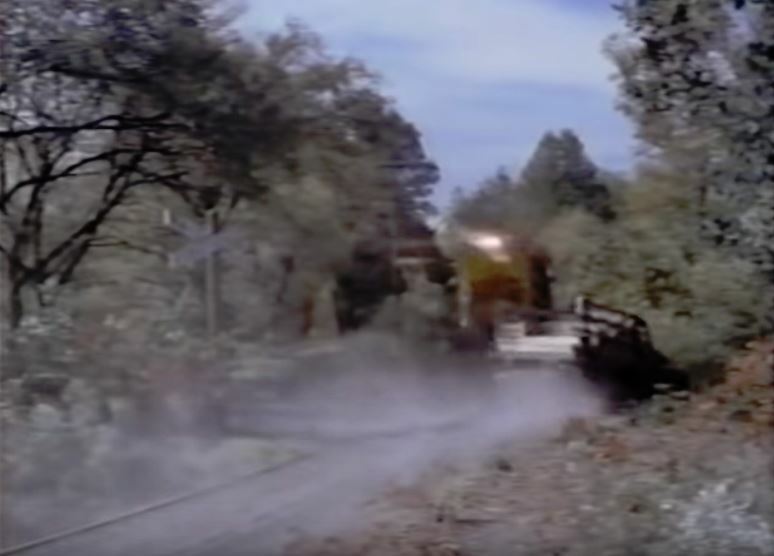 This entry was posted in Uncategorized and tagged 20th Century Fox, Alco RS-3 diesel, Bluegrass State, C.T.C., caboose, Chesapeake & Ohio Railroad, EMD GP9, George C. Scott, Kentucky, Louisville & Nashville Railroad, Michael Sarrazin, Official Guide of the Railways, Old Crow Distillery, Patton, Plunger, Southern Railway, Sue Lyon, The Flim-Flam Man 1967, Three Card Monte, White Lightning. Bookmark the permalink. I watched him as Patten in Shanghai, ha! 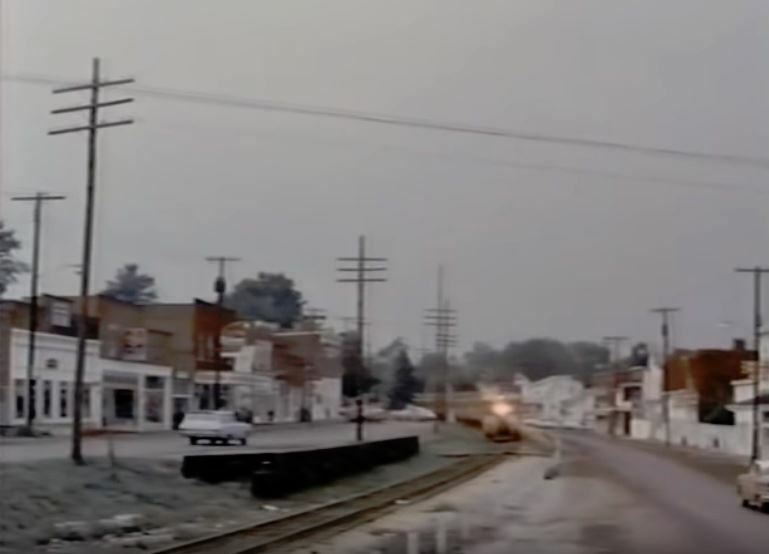 Drove through Lawrenceburg in 2000 and was stopped by a train at the same crossing where the Plymouth Valiant crashed through the downed gates. 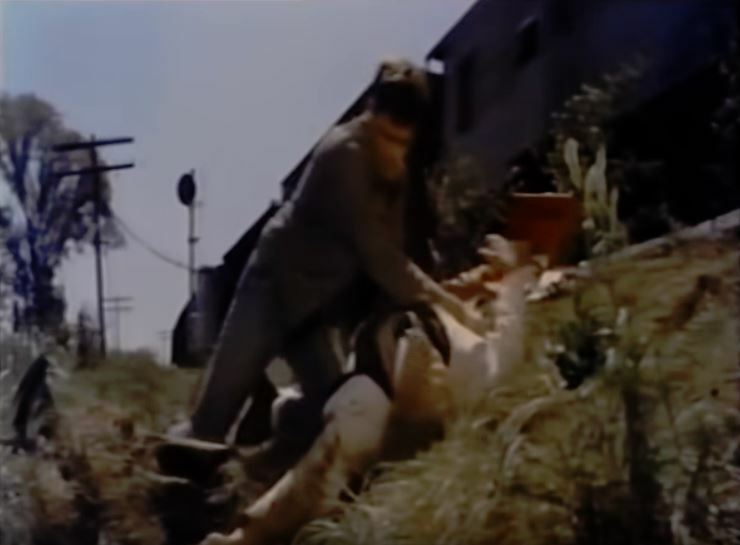 The newspaper editor in town was nice enough to give us a short tour of filming locations as much of the chase was filmed there.He even gave me a FFM movie poster! 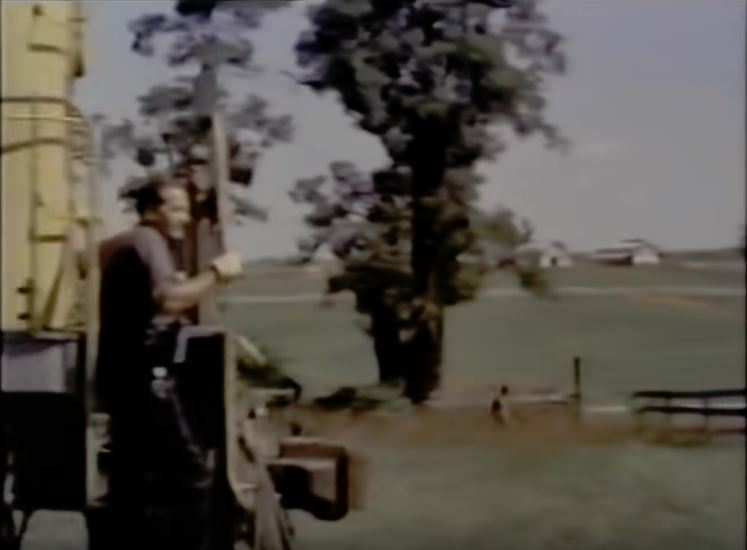 In 2003 we traveled through Winchester Ky. where the “Pigeon drop” scene with Slim Pickens was filmed. 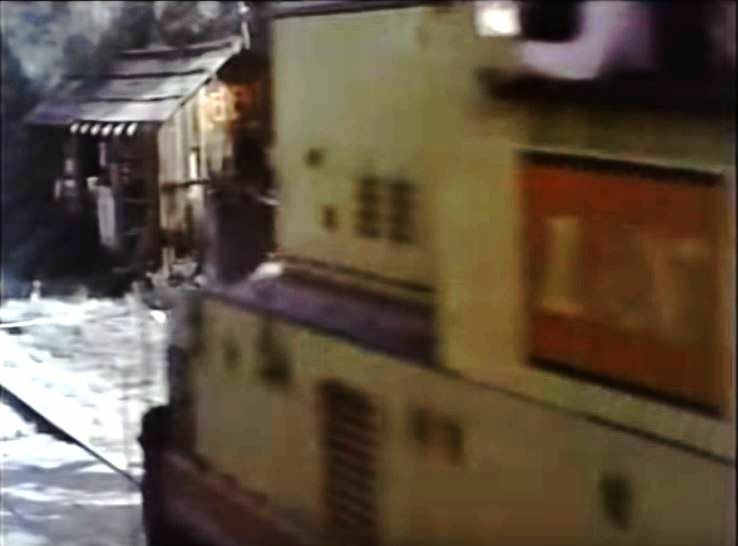 The alley in the scene was near RR tracks and a train is visible and can be heard in the movie. 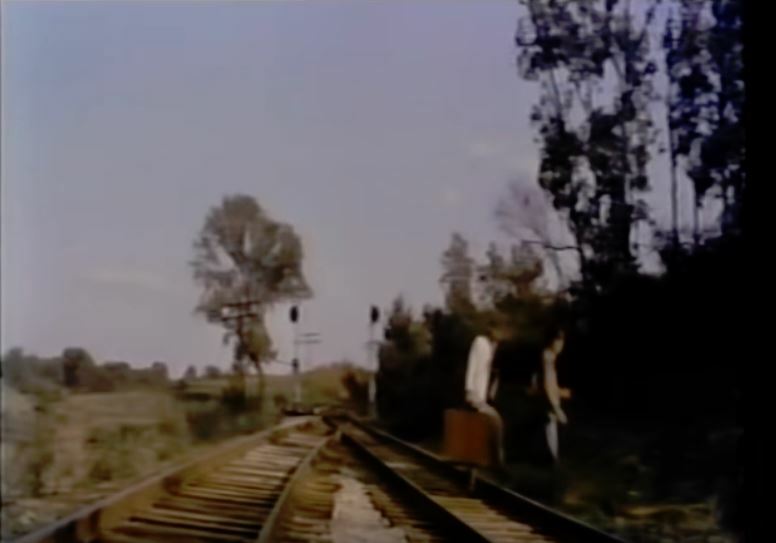 The day we were there as I was filming a train came through the crossing sounding the horn! 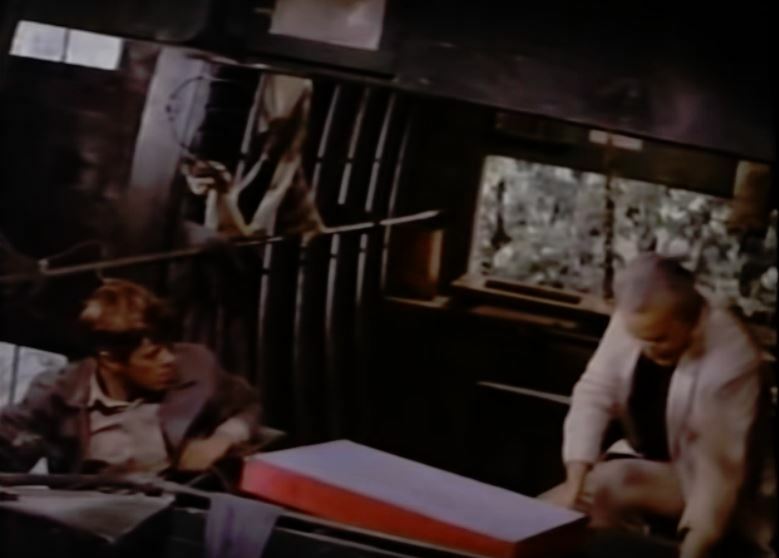 I was able to access microfilm in the towns library and printed off alot of info of the filming as the local newspaper covered it for several weeks. 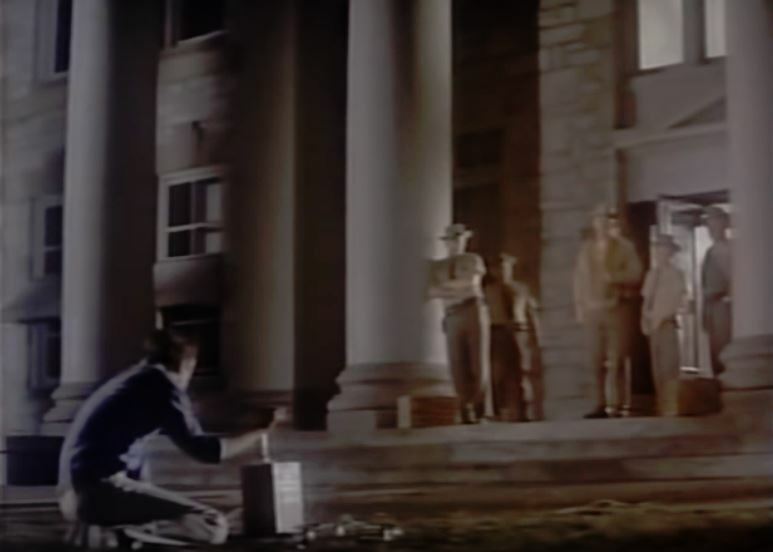 https://www.youtube.com/watch?v=aTMrUZ1c8b4&t=6s I made a comprehensive video of most of the films locations a few years ago. 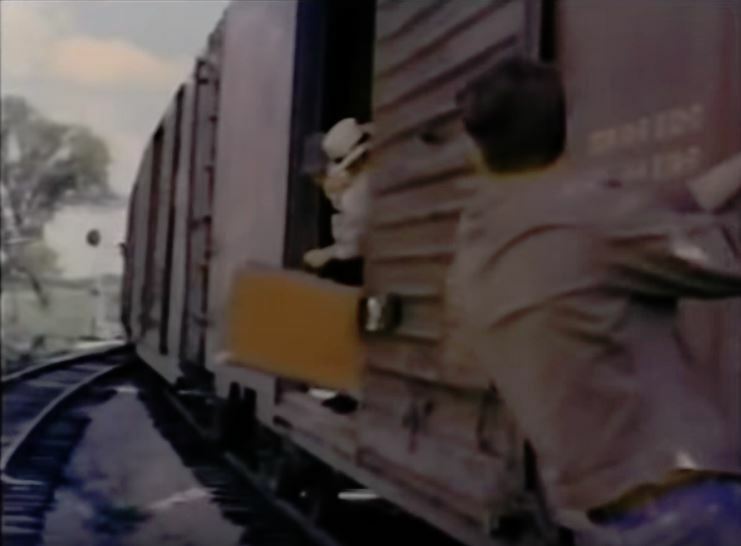 Also the very last scene where Mordeci disappears on the freight was not filmed in KY, it was added on last minute and is actually a quickly dressed up Union Pacific train somewhere in California.